Troop 43 is selling christmas trees continuing it’s annual sale. This is the main funding for the troop, so scouts and adults please help out. Read about Troop 43’s current Eagle Scout candidates and their exciting projects from the menu on the left or in Eagle Projects. On September 22 we hiked on the Lawrence – Hopewell Trail, with scouts completing 5 mile or 10 mile segments. Many spent an exciting two weeks at Ressica Falls Scout camp again this summer – always a scout favorite! This year some of the older scouts went on Boot and Paddle hike and canoe trip during the first week at Ressica. Six of our scouts and three leaders went hiking and camping trip through Isle Royale – a remote island national park right in the middle of Lake Superior. Many excellent pictures here. On April 13th we went to Vorhees State park for 2 days. It was a beautiful place with many things to do. We went on a hike and visited an observatory. Troop 43 went cabin camping and skiing Mar 3&4 at Hunter Mountain. A few pictures are below. Webelos from Pack 43 crossed over at their Blue and Gold Diner Mar 4th and many joined Troop 43. We’re glad to welcome our latest scouts to their new and exciting lives as Boy Scouts! Troop 43’s affiliated Cub Scout Pack 43 had their annual Pinewood Derby this January. With our Den Chiefs helping at the races, all the Cub Scouts had a great time and there were lots of fantastic and fast cars! Here’s one sample we really liked – it depicts the Cub Scouts crossing over to our troop. 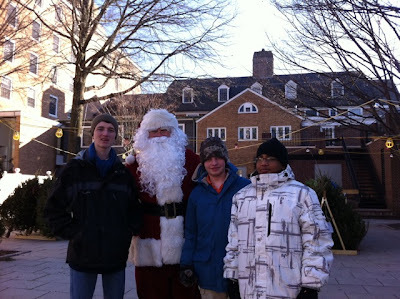 Troop 43 holds its annual Christmas Tree Sale in downtown Princeton again this year from November 28 through Dec 24th. We sell high quality Frasier and Balsam fir trees as well as decorated and undecorated wreaths. In addition, this year we’re selling chocolate bars for all your sweet cravings! Saturday September 17th scouts came out in force to help on the final day of the Mountain Lakes Bridge project. Congratulations! Saturday March 12th, Troop 43 head off to Shawnee Mountain for a day of skiing and fun!